The partnership uses hosted ArcGIS technology to manage the competing demands on the area. Users who want to create online maps can easily access the datasets and GIS capabilities. Partners and local community groups are better informed due to maps generated using ArcGIS. The Irish word lough means an inlet of the sea. The coastal area around Strangford Lough and Lecale is one of the most beautiful and environmentally important in Northern Ireland. It is a vital feeding ground for thousands of birds and a significant site of marine biodiversity. Yet the region also serves a great many local businesses and communities. Founded in 2010, the Strangford Lough & Lecale Partnership (SLLP) coordinates the management of this important site of natural beauty. It aims to protect the diverse natural, cultural, and historic heritage of the Strangford and Lecale Area of Outstanding Natural Beauty (AONB) while encouraging appropriate economic growth and recreational activity. The role of the SLLP involves representing local and special interests and engaging communities in the strategic and coordinated management of the area. 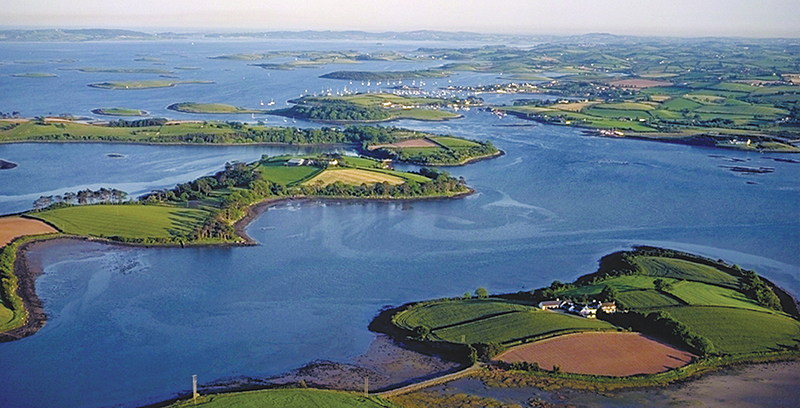 Strangford Lough is possibly the most important example of this coastal feature in Northern Ireland. Strangford Lough has long been designated as a marine nature reserve and protected by UK and European legislation. It has an abundance of diverse wildlife and is home to seals, porpoises, and thousands of birds. Decades later, the importance of the area was further recognized when it was redesignated an AONB. When the SLLP was created, the protected area almost doubled in size. To add to the challenge, the new designation increased interest in the region, so the SLLP needed new ways to collate and disseminate information to interested parties. This interactive map on the www.strangfordlough.org website identifies land-based recreation around Strangford Lough & Lecale. The SLLP had more than 50 datasets, containing details of archaeological sites and marine species, from a variety of sources, including partners and government bodies. The SLLP decided that the best way to make this information accessible and understandable was via the medium of maps. But as a small organization with limited technical capabilities, it needed help to achieve this. As Esri’s ArcGIS solutions are widely used in Northern Ireland, the SLLP contacted Esri Ireland for advice. Esri Ireland developed the GIS solution for the SLLP using ArcGIS software, located on servers at its data center in Dublin. The solution comprises a number of customized, web-based GIS services, which are delivered to the SLLP website users via the cloud. Esri provided desktop links to the hosted ArcGIS solution for users and created a link from within the SLLP’s existing web Content Management System (CMS). Consequently, when users want to create an online map, they can easily access the datasets and GIS capabilities needed while editing a page. The flexibility of the deployed web services architecture, combined with the integration with the CMS, allows users to easily embed maps throughout the SLLP website on a range of pages. This application, therefore, moves away from the notion of a dedicated map viewer and allows maps to be inserted onto multiple web pages to support a variety of content. “The GIS even allows complete novices to create some really effective and attractive online maps,” says Stéphanie Baine, a project officer with the SLLP. To ensure the SLLP gained maximum benefit from its GIS, Esri trained staff, most of whom were new to GIS. GIS now plays a key role in helping the SLLP to promote the AONB. The online maps are accessed by local residents and visitors to the area, as well as academics who are researching the history, geology, or biodiversity of the region. In the first two months after the GIS application went live, a staggering 1,894 unique visitors accessed the organization’s interactive maps online. Since this time, the number of online map users has continued to grow. “The maps have been very popular—and I feel this is because they are so straightforward to use,” says Baine. In addition, maps generated using the ArcGIS solutions are put to good use in meetings with partners and local community groups. Depending on the concerns and interests of each individual group, the SLLP can tailor the maps to show pertinent data. “The maps make a very good impression and help us to promote ourselves and raise awareness of issues,” Baine believes. For example, each winter, pale-bellied brent geese fly from Arctic Canada and Greenland to feed on the mud flats around the edge of the lough. They are tired and hungry from their flight and need peace and quiet to rest and recover. The SLLP used its ArcGIS solution to produce a map showing the locations of the eelgrass beds where the geese feed and alternative locations where kite surfers, canoeists, and other leisure users can access the water. The maps therefore helped the SLLP to improve the well-being of the geese without preventing leisure users from enjoying the lough. For more information, contact Anna Liesching, GIS Department, Strangford Lough & Lecale Partnership.